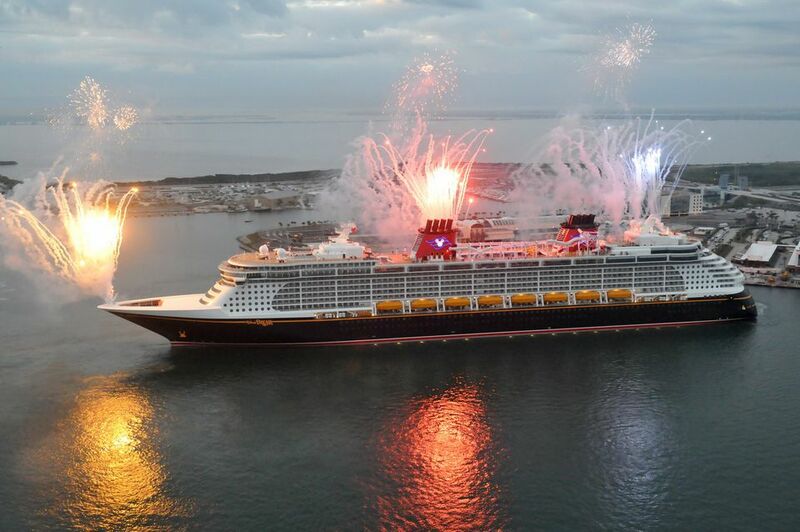 The Disney Dream arrived in Port Canaveral for the first time in January 2011. Before the cruise ship launched, Disney Cruise Line announced some exciting features of the ship and issued the preview images shown in this photo gallery. Some of the innovative features of the Disney Dream include the industry's first-ever water coaster, AquaDuck; virtual portholes in the inside cabins; enchanted art in the common areas and "living" interactive characters in Disney's Oceaneer Lab; an adults-only nighttime entertainment area, The District. Adults will also enjoy the 16,000-square-foot spa. As expected, the Disney Dream is a dream for children, with almost a whole deck dedicated to spaces for kids ages 3 months to 17 years. Tweens and Teens even have their own separate areas, away from the younger kids. Disney continues the rotational dining that is so popular on its other ships. Passengers rotate (with their servers and table mates) amongst three dining rooms during the cruise. The ship also features Palo, Disney's signature adults-only restaurant, and Remy, an upscale premium adult restaurant. The Disney Dream is about 50 percent larger than the Disney Magic and Disney Wonder and has 4000 beds. Read more Disney Dream facts below the photo. Home Port: Port Canaveral, Fla.
Staterooms: 1,250 in total with 150 Inside Staterooms (12%) and 1,100 Outside Staterooms (88%), of which 199 are Ocean view, 860 Verandah, and 21 Suites (with verandah). Three-, four-, and five-night Bahamian itineraries departing from Port Canaveral, Fla.
Nemo's Reef is a shaded water-play area on the Disney Dream for children to play among colorful, interactive figures that move and spray water. The AquaDuck on the Disney Dream is the industry's first shipboard water coaster. Guests aboard the Disney Dream will get swept away on the high-speed flume ride which features twists, turns, drops, acceleration, and river rapids—all while traversing the upper decks of the Disney Cruise Line Disney Dream cruise ship. The Disney Dream has a three-deck atrium lobby with a grand staircase, a dazzling chandelier, and three-story fluted columns. Decorative bronze friezes featuring Disney characters line the balconies and a nearly 5-foot tall bronze statue of Admiral Donald Duck graces the atrium lobby. The central rotunda in Disney's Oceaneer Club on the Disney Dream is the main hub of the club. It has a whimsical Peter Pan's Never Land motif. Children can create and star in their very own theatrical performances, participate in storytelling sessions, and meet Disney characters such as Tinker Bell and Peter Pan. The Disney Dream Disney's Oceaneer Lab for children focuses on discovery and exploration. The room's seafaring theme includes maps, maritime instruments and nautical artifacts. At the main hall stage kids can create and star in swashbuckling performances, hear stories of great expeditions and watch movies. The Animator's Studio on the Disney Dream is filled with animation books, a light box table, drawing accessories, computer stations and other tools of the animation trade. Children can use their imagination to create original, hand-drawn art or learn how to sketch their favorite Disney character. With the help of a counselor and an animation simulator, kids can bring to life computer-animated characters. Pixie Hollow is a children's craft and activity area on the Disney Dream. Pixie Hollow is the land of Tinker Bell and her fairy friends, and has a magical forest setting. Children can make crafts while sitting on stools shaped like acorns and mushrooms. Other activities in Pixie Hollow include dressing up in fanciful costumes and participating in storytelling. Disney-Pixar's movie "Toy Story" comes to life in Andy’s Room on the Disney Dream. Kids can experience the feeling of being toy-sized as they play among larger-than-life characters from the animated film—such as Mr. Potato Head, Hamm the piggy bank, and Rex the dinosaur. Children can rearrange features on Mr. Potato Head, crawl though the coiled body of Slinky Dog, and get behind the wheel of an oversize, remote-controlled race car. Teens ages 14 to 17 have an exclusive club aboard the Disney Dream with Vibe. Outside, teens have a private deck area—a modern space where they can enjoy fun in the sun without ever leaving the teen club. There are plenty of mod chairs and chaise lounges for sunbathing, two wading pools, fountains, pop jets and misters for cooling off. The Disney Dream Vibe is an exclusive club for teens ages 14 to 17. Inside, a media room serves as the central gathering space with video gaming and movie watching. Teens can watch personal video screens or play video games in built-in, individual wall "pods." The Disney Dream nursery is named the "It’s a Small World Nursery", and the space is inspired by the classic Disney theme park attraction. Designed for infants and toddlers ages three months to three years, the nursery features interactive, hands-on features such as horns that honk, wheels that spin, and buttons to press. The Disney Dream Enchanted Garden is a 14,714 sf casual restaurant on Deck 2. Inspired by French gardens, it features a dining environment that transforms from day to night. Custom glass "flower" light fixtures, ornamental light posts and a terrace fountain add enchantment to the room. At the fountain’s pinnacle stands a fanciful Mickey Mouse statue. The Disney Dream Enchanted Garden casual restaurant that transforms from day to night. During the evening meal, the sky overhead first becomes a sunset, then changes into a twinkling field of stars. The light fixture flowers "bloom" and become infused with color and the centerpiece fountain is basked in light. Palo is the adults-only signature specialty restaurant on the Disney Dream cruise ship. Similar to Palo on the other Disney ships, the romantic dining venue features breathtaking ocean views, rich decor and excellent cuisine. Named after the colorful poles that line the canals of Venice, Palo offers a memorable dining experience in an upscale atmosphere. The Disney Dream Animator’s Palate is a signature Disney Cruise Line restaurant that brings the magic of Disney animation into the dining room for a one-of-a-kind experience that will captivate the entire family. On the Disney Dream, the restaurant is inspired by classic animator’s studios and filled with character sketches, paint brushes, film strips and other tools of the animation trade. “Paint brush” pillars and “pencil” columns span from floor to ceiling. The Disney Dream Royal Palace is an elegant restaurant inspired by the classic Disney films "Cinderella," "Snow White," "Beauty and the Beast," and "Sleeping Beauty." The décor includes a hand-blown chandelier made of glass slippers, with essential elements from each fairy tale such as royal crests, roses and tiaras. With meticulous attention to detail, many of the restaurant's features are modeled precisely from the inspirational films. The verandah staterooms on the Disney Dream feature a contemporary, Art Deco-inspired design in a welcoming environment. Eighty-eight percent of the Disney Dream’s 1,250 staterooms are outside rooms, and of those, 90 percent have a private verandah. Two interesting new features on the Disney Dream interior cabins are the virtual porthole and the starlit ceiling over the bunk beds. Eighty-eight percent of the 1,250 staterooms on the Disney Dream are outside rooms, and of those, 90 percent have a private verandah. To accommodate larger families and groups traveling together, there are 500 connecting doors adjoining staterooms. For groups wishing to sail in ultimate luxury, the Disney Dream provides adjacent, concierge-level accommodation for up to 25 guests with four suites and two staterooms, all joined by connecting doors. Disney Dream cabins offer comfort and style to cruising families. A cruise industry-first for all inside staterooms, Virtual Portholes offer a "window" with a real-time electronic view outside the ship. Entertaining, animated characters, such as Peach the starfish from the Disney-Pixar film "Finding Nemo," may pop by the Virtual Porthole, as Disney mixes a live view of the scenery with animation. The Disney Dream Senses Spa & Salon is a 16,000-square-foot ocean view spa. The spa villas feature an indoor spa treatment suite connected to a private outdoor verandah with personal whirlpool hot tub, shower and a plush, and double lounge chair. The Disney Dream Skyline Lounge is found at The District and celebrates some of the world's most famous cities. Tall "windows" along one wall give guests a view of stunning city skylines such as Paris, London, Los Angeles, Tokyo and Hong Kong. Skyline's "windows to the world" are ever-changing as the spectacular city skylines transform from day to night, in real time as each day progresses. The Disney Dream Pink is an elegant and upscale cocktail bar at The District, serving top-shelf wines and liquor as well as champagne. Back-lit glass "bubbles" covering the walls create the effect of cascading, effervescent champagne. A feature wall behind the bar with dew-drop shaped glass in pink and gold gives the impression of champagne bottles bursting with bubbly. The Disney Dream Evolution Club brings a piece of big city night life to the high seas. Inspired by the evolution of the butterfly, wing patterns on the walls and trails of light along the ceiling impart the feeling of butterflies in flight. The heart of the Evolution club is a lighted dance floor that changes with the intensity of the music and a colorful butterfly-shaped feature light on the ceiling above.